August | 2016 | Why Is The Internet Broken? NetApp Insight 2016 in Las Vegas is approaching quickly (too quickly if you have to present sessions). Last year, I created blogs to highlight the sessions I’ll be presenting, in case any of you are attending Insight and want to pop in. This year, more of the same! I’ll also be doing some Tech ONTAP podcast stuff. Want to be interviewed? Let me know or email podcast@netapp.com with the subject “Insight 2016.” We’ll roll them into our daily Insight recaps or the post-Insight show. I’ll be presenting this one with Dave Morera (@greatwhitetec) of HA Storage in Las Vegas and Mark Carlton (@mcarlton1983) of Arrow in Berlin. Both are members of the NetApp A-Team. This session will present partner and customer use cases, real-world experience and lessons learned in network file system deployments and implementation for virtualized environments. Learn who prefers network file system over iSCSI for VMware® deployments, what Microsoft® applications are supported on network file system in virtual machine disks. Find out how to make sure your network file system virtual machine deployments are following the best practices from people who implement and architect on a day-to-day basis. You may or may not have heard of FlexGroups. If so, come to this session to get a deep dive into the inner workings of the new scale-out NAS file system. If you haven’t, check out Sunitha Rao’s FlexGroup Overview session (61054-1) and then come to mine anyway. NetApp® ONTAP® 9 FlexGroup technology provides a new way to increase scapacity to near infinite levels while increasing performance for concurrent workloads. This technical deep dive will take a look at what is FlexGroup, how they work under the covers, as well as how FlexGroup’s stack up to other scale out NAS solutions on the market today. Come learn about the next generation of scale-out NAS solutions and find out how to do more with less! This is a reprise of last year’s popular session (rated nearly a 5.0!) where we go into a deep dive of ONTAP’s authentication mechanisms for NAS. This is a level 3 session and internal to partners and NetApp employees only. Authentication in NetApp® ONTAP® uses the security daemon (SecD) for connectivity to external dependencies for NAS protocols such as active directory, LDAP, NIS and DNS. This session will cover how the security daemon works in ONTAP and beyond, as well as how to troubleshoot issues and what kind of statistics are available for the security daemon and external name services. Also, check out Melissa Wright’s (@vMiss33) session list here! This week, we bring in the Storage Janitor™ himself, Andy Banta (@andybanta) to do a deep dive into VVols on SolidFire. Andy will also be at VMWorld to answer your VVol questions, so be sure to visit him at the NetApp booth! Andy likes to work in dirty word phrases to his podcasts, so see if you can find the hidden gem in this one. Hint: He intersperses it in several sections. This week, we welcome a very special guest – developer advocate rockstar Kelsey Hightower (@kelseyhightower) from Google/Kubernetes! Kelsey gives us the run down on his views on advocacy vs. evangelism and where Kubernetes fits in with a changing IT landscape. I was able to convince Kelsey to join us by simply asking. Super accessible! If that’s not enough, we also bring in NetApp SolidFire’s developer advocate, Josh Atwell (@josh_atwell). Josh echoes some of the same feelings as Kelsey, and gives us his Monty Python pitch for Puppet. Keith also made use of the guest beard/neckbeard/mullet. What’s the deal with remote I/O in ONTAP? I’m sure most of you have seen Seinfeld, so be sure to read the title in your head as if Seinfeld is delivering it. I used a comedian as a starter because this post is about a question that I get asked – a lot – that is kind of a running joke by now. When Clustered Data ONTAP first came out, there was a pretty big kerfuffle (love that word) about the architecture of the OS. After all, wasn’t it just a bunch of 7-Mode systems stitched together with duct tape? It’s a complete re-write of the ONTAP operating system, for one. The NAS stack from 7-Mode was gutted and became a new architecture built for clustering. Then, in 8.1, the SAN concepts in 7-Mode were re-done for clustering. So, while a clustered Data ONTAP cluster is, at the hardware level, a series of HA pairs stitched together with a 10GB network, the operating system has been turned into essentially what I like to call a storage blade center. Your storage systems span clusters of up to 24 physical hardware nodes, effectively obfuscating the hardware and allowing a single management plane for the entire subsystem. Every node in a cluster is aware of every other node, as well as every other storage object. If a volume lives on node 1, then node 20 knows about it and where it lives via the concept of a replicated database (RDB). Additionally, the cluster also has a clustered networking stack, where an IP address or WWPN is presented via a logical interface (a LIF). While SAN LIFs have to stay put and leverage host-side pathing for data locality, NAS LIFs have the ability to migrate across any node and any port in the cluster. What is the deal with remote I/O in ONTAP? Since you can have multiple nodes in a cluster and a volume can only exist on one node (well, unless you want to check out FlexGroups), and since data LIFs live on single or aggregated ports on a single node, you are bound to run into scenarios where you end up traversing the backend cluster network for data operations unless you want to take on the headache of ensuring every client mounts to a specific IP address to ensure data locality, or you want to leverage one of the data locality features in NAS, such as pNFS or node referrals on initial connection (available for NFSv4.x and CIFS/SMB). I cover some of the NFS-related data locality features in TR-4067, and CIFS autolocation is covered in TR-4191. In SAN, we have ALUA to manage that locality (or optimized paths), but even adding an extra layer of protection in the form of protocol locality can’t avoid scenarios where interfaces go down or volumes move around after a TCP connection has been established. That’s pretty much it. It’s a beefy, robust backend network that is *extremely* hard to saturate. You’re more likely to bottleneck somewhere else (like your client) before you overload a cluster network. Remote I/O absolutely adds overhead to operations. There’s no technical way around saying it. Suggesting there is no penalty would be dishonest. The amount of penalty, however, varies, depending on protocol. This is especially true when you consider that NAS operations will leverage a fast path when you localize data. I’ll answer with some anecdotal evidence – I spent 5 years in support, working on escalations for clustered Data ONTAP for 3 of those years. I closed thousands of cases over that time period. In that time, I *never* fixed a performance issue by making sure a customer used a local data path. And believe me, it wasn’t for lack of effort. I *wanted* remote traffic to be the root cause, because that was the easy answer. Sure, it could help when dealing with really low latency applications, such as Oracle. But in those cases, you architect the solution with data locality in mind. In the other vast majority of scenarios, the “remote I/O” penalty is pretty much irrelevant and causes more hand wringing than necessary. The design of clustered Data ONTAP was intended to help storage administrators stop worrying about the layout of the data. Let’s start allowing it to do its job! 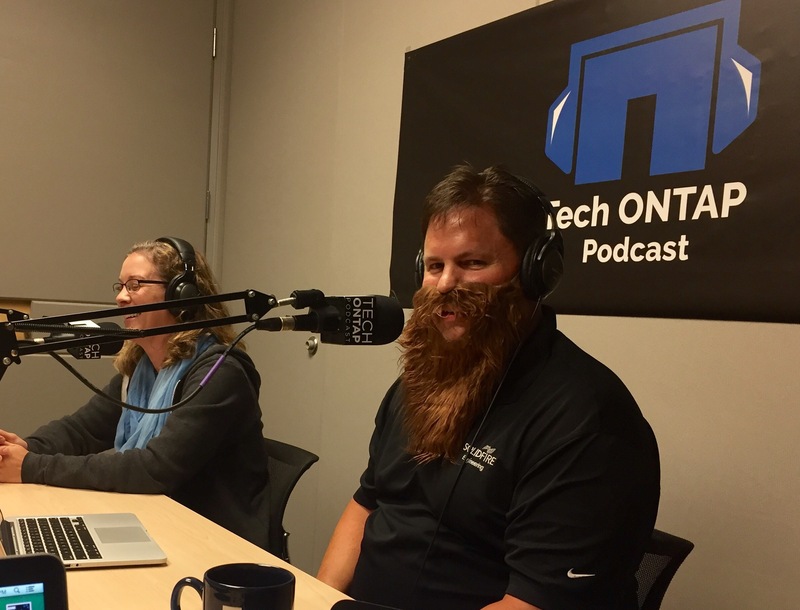 This week, we welcome Ross Ackerman (@TheRossAckerman) to talk about some improvements to the NetApp Support site experience, and how customers can leverage support without having to open cases or pick up the phone. The first thing we discuss is a feature called “Guided Problem Solving.” This feature is exactly what it sounds like – a guided problem solver. If you want more information, check out the white paper on Guided Problem Solving and Chat. Since I am the NFS dude, I picked NFS. When you click on the desired subject, you get a new page. It starts off with the setup and configuration docs, mainly because that’s one of the first things people are trying to find. However, there are also areas to find KBs, Tech Reports and community posts on the selected subject.